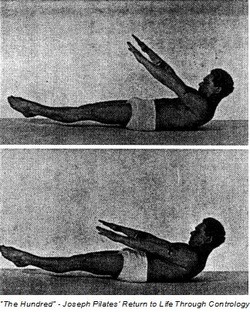 Pilates is an exercise system based on using your own bodyweight as a resistance in order to strengthen the muscles in your torso. These include all the muscles in the front, sides, back, hips, and shoulders. If you've ever had back pain, it probably looks like he is going to hurt his back in this position. However, he has strengthened the muscles in the front of his torso so much that they are what are holding his legs and arms up. In today's sedentary world of sitting at a desk, many people never develop strength in the front of their bodies. Bending forward allows your tummy to relax and your back to take over. Your shoulders also roll forward putting pressure on your neck. Pilates teaches you to be more aware of your posture and to develop the strength you need to be able to hold yourself in a safer position all day long. I often hear people say they need to do pilates to "strengthen their backs" but this is a misunderstanding of what your body needs- your back needs help from the muscles in the front and sides of your body to perform everyday movements safely. It is likely already very strong from years of hard work! Through proper breathing, concentration, awareness and focus all this can be developed in your body over time. Pilates used to say "In 10 sessions you will feel the difference, in 20 you will see the difference, and in 30 you will have a whole new body!" Visit my testimonials page for some quotes from my clients about this amazing transformation.